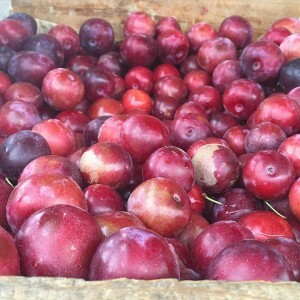 Each summer, I eagerly await the “Farmer’s Plums” I buy from “Jake’s Farm Stand” on the Boston Post Road in Madison, Connecticut. Jake opens shop for just a few months on the side of the road, bringing with him the bounty of his family farm in Northern Connecticut. He uses a pencil and paper to figure out up your purchase and always rounds down. My favorite of his treasures are what he calls “Farmer’s Plums,” which are more widley known as “Methley” plums. 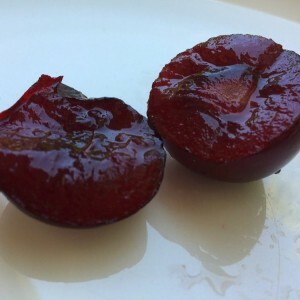 These plums grow for 2 to 3 weeks per year on 22 trees that belong to Jake’s father and are the the sweetest I’ve ever tasted–and the fact that I can only taste them for such a short time certainly adds to their sweetness.